Sometimes, there are cases when multiple submissions are made to a form, one after the other, and the same data (for some fields) is repeatedly typed for each submission. You can set up the form to copy the data from the previous submission and pre-populate the fields with that data in the new submission. This way, the fields that will have the same data as the previous submission don't need to be filled again. You can achieve this by redirecting the users to the same form after submit and pre-populate the form via URL parameters. NOTE: File Upload fields and some Widgets cannot be pre-populated via URL parameters. 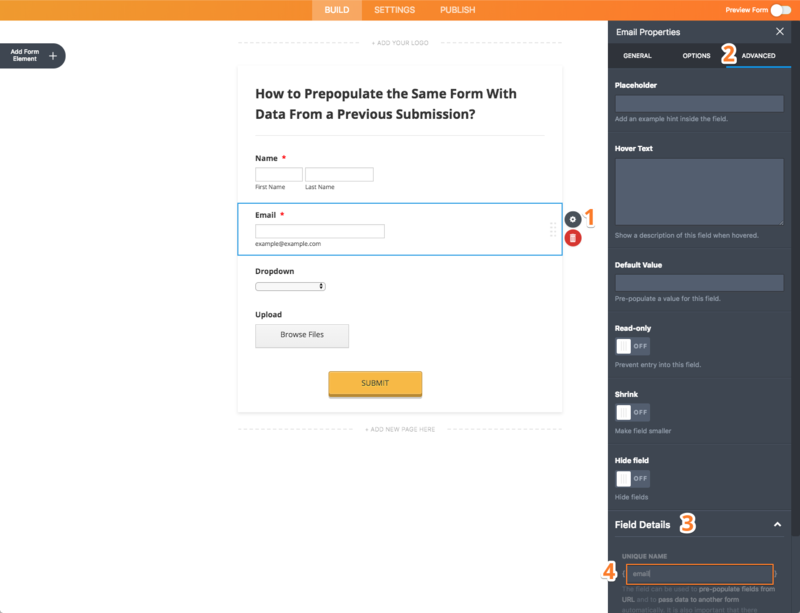 In the Demo Form, the fields that will be pre-populated after submission are First Name, Last Name, and Email. Adjust the Redirect URL with the URL of your form and the field names of your form and you should be good to go. The Unique Name of the fields can be found in the Advanced Properties of the field. The users can also be redirected conditionally. In fields like phone number and address, how do I separate out the information when transcibed to the new form? Right now, the whole phone number is getting copied into the area code box and the entire address is getting copied over to the street address field. How do I create a form using data from the previous submission? Prepopulate Checkboxes - Not Quite Working - Help!